An elbow injury can be a painful experience that may require the skilled services of a physical therapist. Learning about the different elbow ligaments and muscles and the common injuries of the elbow can help you understand your specific injury and rehab if you suffer an elbow injury. The elbow joint is formed by three bones: the humerus, radius, and ulna. Articulations between the trochlea of the humerus with the ulna and the capitulum of the humerus with the head of the radius comprise the joint. The elbow is an example of a hinge joint or a joint that moves in only one direction. Your elbow joint bends and straightens like a hinge on a door. Ligaments are strong pieces of cartilage that connect one bone to another. They help provide support to your joints while still allowing for a motion to occur. Ligaments are essential for providing your elbow joint with stability while still allowing for a motion to occur. Three ligaments are present in the elbow joint: the ulnar collateral ligament, the radial collateral ligament, and the annular ligament. These ligaments provide strength and support to the elbow joint along with the surrounding muscles or your arm and forearm. If an injury occurs to the elbow joint, any one of these ligaments may be injured. The annular ligament courses around the head of your radius bone. The ligament helps to keep your radius in place as you rotate your forearm when you turn your hand and wrist over. The ulnar collateral ligament is a strong fan-shaped condensation of the fibrous joint capsule. It is located on the medial side of the joint, extending from the medial epicondyle of the humerus to the proximal portion of the ulna. This ligament guards your elbow against a severe valgus stress or pressure from the outside of your arm. The radial collateral ligament is also a strong fan-shaped condensation of the fibrous joint capsule. It is located on the lateral side of the joint, extending from the lateral epicondyle of the humerus to the head of the radius. This ligament guards the joint against excessive varus, or inner to outer, stress. 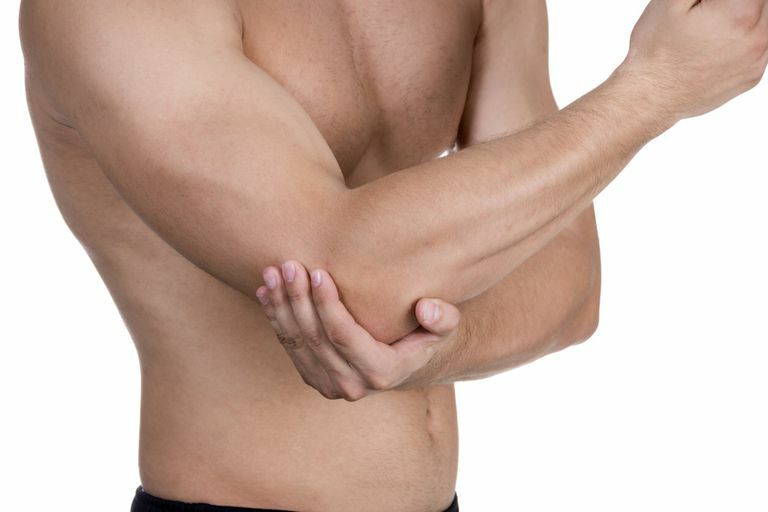 A common way to injure your elbow is via a FOOSH injury. FOOSH is an acronym for fall on outstretched hand. If you fall down and try to break your fall by reaching out your hand, you may place excessive stress on your elbow's ligaments, causing an injury. Injuries to ligaments may include overstretching or tearing. If you have suffered an elbow injury or have elbow pain, there are a few things you should do to start treatment right away. First, you should check in with your doctor to rule out any serious injury to your elbow's ligaments or bones. The last thing you want is to treat a serious elbow fracture like a minor strain. After an elbow injury, you may benefit from using the RICE method to help control the inflammation process. The RICE acronym stands for rest, ice, compression, and elevation. Rest your elbow, apply an ice pack, and elevate your arm to minimize the swelling. Some physical therapists are now advocating the POLICE method of injury management. This stands for protection, optimal loading, ice, compression, and elevation. This method simply takes out the rest and adds some protection to your joint while still allowing for some motion to your elbow as it heals. You may benefit from a gentle range of motion exercises for your elbow after an injury. Visit your physical therapist for a complete assessment to see which exercises you should do to get your elbow moving. After a ligament injury to your elbow, you may also benefit from strengthening exercises for your forearm and wrist to help provide muscular support to your elbow. Again, your PT can prescribe the correct exercises for your condition. Your elbow is a complex joint that allows for a combination of mobility and stability. The ligaments of your joint play an important role in maintaining stability to your elbow. If you have suffered an elbow ligament injury, your physical therapist can help you regain full mobility and strength so you can return to your previous level of function and activity. Mak S, Beltran LS, Bencardino J, et al. MRI of the Annular Ligament of the Elbow: Review of Anatomic Considerations and Pathologic Findings in Patients With Posterolateral Elbow Instability.American Journal of Roentgenology. 2014;203(6):1272-1279. doi:10.2214/ajr.13.12263.